Publisher: Alfred a Knopf Inc, Westminister, Maryland, U.S.A. In another feat of hypnotic storytelling, Anne Rice continues the extraordinary Vampire Chronicles that began with the now classic Interview with the Vampire and continued with The Vampire Lestat and The Queen of the Damned. Lestat speaks. Vampire-hero, enchanter, seducer of mortals. For centuries he has been a courted prince in the dark and flourishing universe of the living dead. Lestat is alone. And suddenly all his vampire rationale--everything he has come to believe and feel safe with--is called into question. In his overwhelming need to destroy his doubts and his loneliness, Lestat embarks on the most dangerous enterprise he has undertaken in all the danger-haunted years of his long existence. 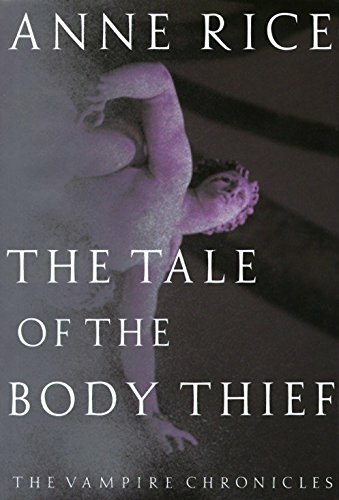 The Tale of the Body Thief is told with the unique--and mesmerizing--passion, power, color, and invention that distinguish the novels of Anne Rice. It's been said that Vladimir Nabokov's best novels are the ones he wrote after starting a failed novel. Anne Rice wrote The Body Thief, the fourth thrilling episode of her Vampire Chronicles, right after she spent a long time poring over that most romantic of horror novels, Mary Shelley's Frankenstein, to research a novel Rice abandoned about an artificial man. Perhaps as a result of Shelley's influence, The Body Thief is far more psychologically penetrating than its predecessors, with a laser-like focus on a single tormented soul. Oh, we meet some wild new characters, and Rice's toothsome vampire-hero Lestat zooms around the globe--as is his magical habit--from Miami to the Gobi desert, but he's in such despair that he trades his immortal body to a con man named Raglan James, who offers him in return two days of strictly mortal bliss. Lestat has always had a faulty impulse-control valve, and it gets him in truly intriguing trouble this time. On the plus side, he gets to experience romance with a nun and orange juice--"thick like blood, but full of sweetness." But Lestat is horrified by an uncommon cold, and his toilet training proves traumatic. He's also got to catch Raglan James, who has no intention of giving up his dishonestly acquired new superpowered body. Lestat enlists the help of David Talbot, a mortal in the Talamasca, a secret society of immortal watchers described in Queen of the Damned. Selling books I've collected over the years. Autographed copies. First editions.